Something is rotten in the state of Offaly. 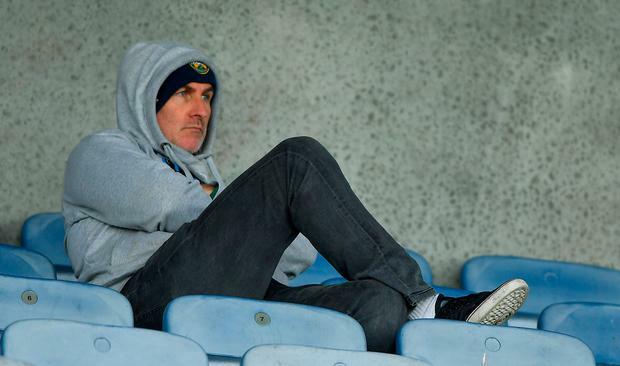 The defeat to Wicklow and the subsequent dismissal of Stephen Wallace has shone a light on the Faithful county and it ain't basking in its glow. County Board: We're acting in the best interest of the players. Players: We're 100pc behind Stephen Wallace and his management team. County Board: Stephen is gone and we're hiring an interim manager for the rest of the year. County Board: We're letting Stephen go because he can't take part in training and he can't be on the sideline for games. Wallace: I haven't been able to take part in training for two weeks now (since the Kerry Hearing Committee upheld his proposed eight-week ban). County Board chairman: I was unaware that our inter-county football manager had an appeal against an eight week ban on Saturday and only heard that it was unsuccessful on Sunday. County board: Players still in the under-20 age bracket will play at that grade only in Championship. Wallace: We want Cian Johnson to be available to us for Championship. County board: Denied. We stand by our rule. Interviewer: Does the Offaly county board have too much of a say in matters relating to the senior team? County board chairman: The county board wouldn't be involved in what goes on at training or anything like that other than what we have to put in place. Wallace: The County Board has put roadblocks in our way every second of every day. County Board chairman: He's bound to be hurting now. I'm not going to get into that. We haven't had ongoing battles with him. Stop me if I'm missing something. So the players handed Offaly county board chairman Tommy Byrne a statement at around 8pm stating their desire to continue under Wallace's reign, a management committee meeting was convened at 8.30pm and soon afterwards Byrne calls Wallace to say goodbye. The Faithful squad must be scratching their heads this morning. Their wishes have been ignored, the manager that was trying to put a three-year plan into action is gone, one of their star players has been kept from playing for them by an internal rule and they have no manager in place for a first round qualifier game on June 9. At least they have the consolation in knowing that the decision was made in their best interest. Their reasoning for axing Wallace simply doesn't add up. If it was fine for him to manage the team over the last fortnight while under suspension then why has it suddenly become impossible. Byrne accepts responsibility for Wallace's appointment but won't resign. To be fair, he couldn't possibly have foreseen what occurred in the game between John Mitchels and Ardfert in March but the fact that he was unaware that Wallace's appeal was going ahead on Saturday and wasn't aware of the result until a few hours before the defeat to the Garden county is much more concerning. Former Offaly referee Brian Gavin hit the airwaves this week to make revelations surrounding Sunday's game only to have some of his claims contradicted by one of the players on social media. He was a highly respected referee but his intervention is almost unprecedented and I wonder will the Offaly squad thank him for it now. The story feels incomplete and we may never know the details in their entirety. Offaly have a fabulous new training facility at 'Faithful Fields', there is clearly a desire to return to the glory days of the past but they seem to be getting in their own way.